There are memorials dedicated to the men and women who gave their lives during World War Two all over the world. Below are some dedicated to those who served in the Air Force that have relevance to the pages on this site. The Air Forces Memorial, Runnymede, Surrey more commonly referred to as the Runnymede Memorial. This memorial stands on a hillside above Runnymede where the Magna Carta, enshrining man's basic freedoms under law, was sealed by King John in 1215. The Memorial commemorates over 20,000 men who died, were lost without trace and have no known grave who flew in operations from bases in the UK and North and Western Europe.The Memorial is open to the public every day except Christmas Day and New Years Day. Click here to view more photographs of the Memorial and read more about it. Aircrew Memorial Bandstand in Bellfield Park, Inverness to the memory of Military Aircrew of all Services and Nationalities who were killed, or died of wounds, while flying Operationally in war times or on Training Sorties from the 32 bases (Airfields, Harbours and Flying Boat Moorings) in the Highlands, the Islands and the Grampian Areas of Northern Scotland throughout the many 20th Century European and Overseas Wars. The names of the airfields, and anchorage's are engraved in the handrails of the memorial, and the national flowers are depitcted in the roundels. The weather vane on the top is, appropriately, a windsock. Click here for more information about the memorial and details about the squadrons and bases. To the memory of the crew of Halifax R9438 (H), 35 Squadron, who crashed into the cliffs here on returning from an air raid on the Tirpitz, 30/31st March 1942. 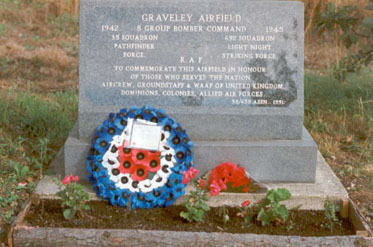 Marker stone at the entrance to Graveley Airfield, Cambridgeshire, England, laid in 1992 to commemorate the 50th Anniversary of the founding of the Pathfinder Force. 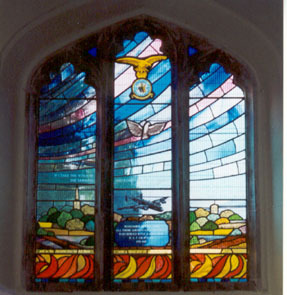 The 35 Squadron Memorial Window in All Saints Church, Offord Cluny, Cambridgeshire, England, was unveiled on Sunday 15th November 1998 by Mrs Ly Bennett, wife of the late Air Vice Marshal Don Bennett. In April 1942, Wing Commander Bennett, as he was then, survived with the rest of his crew when they bailed out of their stricken Halifax W1041 ZA-B during an attack on the German Battleship Tirpitz. The window was designed and installed by Gordon Monaghan. ERECTED BY LOCAL PEOPLE 1985.
one of the mines dropped by the Halifax bombers resting on the links. Memorial stone in Norway for 1 PRU Spitfire Pilot, Flying Officer Frederick Ian Malcolm, with the steep sides of Forbordfjell where his Spitfire AB 127 crashed on 10th May 1942. Parts of his aircraft have been placed beside the memorial. The Spitfire crashed into the side of Forbordfjell some three miles to the south of where Tirpitz was moored. When the aircraft was located Flying Officer Malcolm was discovered still seated in the aircraft. Flying Officer Malcolm is buried in Stavne Cemetery in Trondheim, Norway. 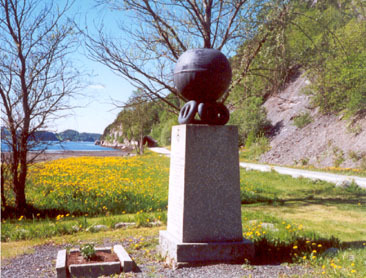 Memorial at Børas, Skjekstadmark, Norway, to the crews of 35 Squadron Halifax W1020 TL-K and 97 Squadron Lancaster L7572 OF-L. Both these aircraft crashed in the same area during the April 27/28th attack against the German Battleship Tirpitz which was moored in Fættenfjord with the loss of all onboard. The memorial, a stone boulder, has the names of each crew member engraved on it below the RAF crest. It is surrounded by a circle of thirteen smaller boulders, each representing one of the airmen killed. 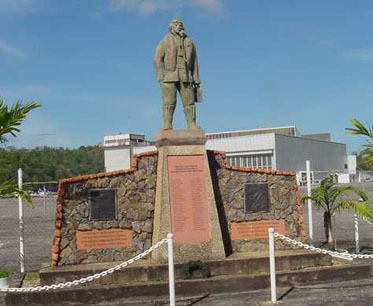 This monument, erected in 1993, stands beside the Chaguaramas Military History and Aerospace Museum on the Caribbean island of Trinidad to honour all airmen from Trinidad and Tobago who gave their lives while serving in military aviation. 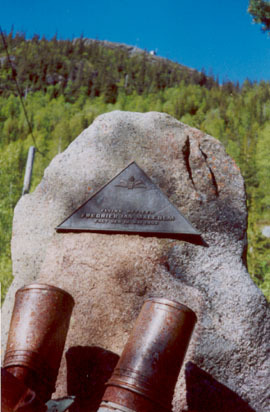 The plaque to the right reads "In memory of the Trinidad and Tobago Flight Crew who fell in the cause in Freedom and in honour of all who served in Military Aviation." 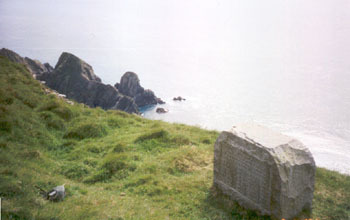 The plaque to the left reads "In memory of the American Airmen who flew from Trinidad and in honour of the gallantry displayed by both sides during the conflict in these waters." The centre panel lists the names of those who gave their lives. 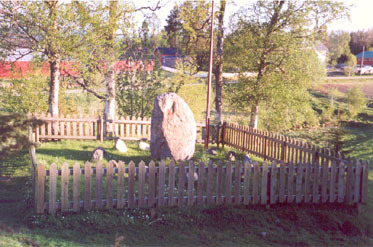 Memorial cairn beside Loch a' Chàirn Bhàin near Kylesku in Sutherland, Scotland, to honour the memory of the 39 men from Twelfth Submarine Flotilla who lost their lives between 1942 and 1945. Loch a' Chàirn Bhàin was used to train the Chariot and X-Craft crews who took part in several attacks against Tirpitz in Norway as well as other targets in Italy and the Far East. "The security of these top secret operations was guarded by the local people of this district who knew so much and talked so little...............The silent hills remember the young men of His Majesty's X-Craft Submarines and Human Torpedoes who were trained in these wild and beautiful waters. At the going down of the sun we will remember them."